Pacific Investment Management Co., a unit of German insurer Allianz SE, added $11 billion of assets-under-management in the third quarter, reversing outflows from the prior quarter. It might portent bigger investor inflows after years of super-low bond yields caused by quantitative easing. Certainly the minutes of Thursday’s U.S. Federal Reserve meeting show no signs it will stop its quarterly pace of 25 basis points rate increases, regardless of Donald Trump’s complaints. And this was all before October’s shakeout of equities – although, in fairness, junk bonds had an equally tough time. Still, with the relentless upward march of equity indexes finally weakening, fixed-income funds might be the beneficiary. 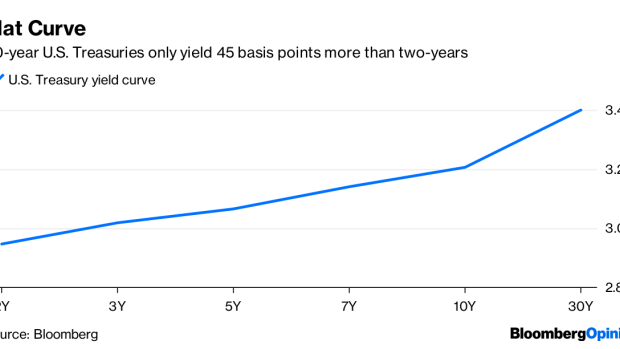 The U.S. Treasury yield curve is still remarkably flat, with only an extra 45 basis point gain in yield between two-year and 30-year notes. So there’s little incentive to venture far from shorter maturity cash bills and bonds. That’s why the extra return from corporate credit is more appealing. The average yield on the Bloomberg Barclays U.S. Corporate High-Yield Total Return Index is at 6.7 percent. So it’s little surprise that Pimco's growth is not coming from its old flagship Total Return Fund, which tends to stick mostly to plain vanilla stuff but has reduced from $300 billion to a little under $60 billion now. Instead it’s coming from so-called “enhanced cash strategies,” which bring more credit risk but higher yields. This is fund-speak for investing in higher-yielding corporate debt rather than government bonds. Inflows aren’t just coming from nervous stock investors but also from emerging market bonds which had a torrid summer amid crises in Turkey and Argentina. Domestic U.S. bond funds offering comparably higher yields are the logical alternative until U.S. growth starts to falter, explaining Pimco’s recent appeal. Once the super-charged economy slows, safer government bond-heavy funds will get their moment in the sun, which would be fine for Pimco too.